Our local food cooperative has a delightful cafe gallery where you can enjoy a cup of tea, something fresh from the bakery or relax after a little grocery shopping. 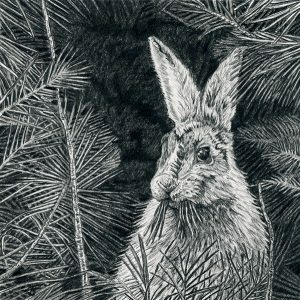 While you’re there, you can take a look at some of my original pencil artwork currently on display. And, if you see some artwork you love, you can simply take it off the wall and purchase it right at the check out. Gives a whole new meaning to “one stop shopping”! The art will be on exhibit until April 30th. This entry was posted in Exhibitions and tagged animal art, art show, bird art, black bear, black capped chickadee, bobcat, NH Artist, owl art, pencil art, snow shoe hare, white mountain artist. Bookmark the permalink.